As a result of enemy action yesterday, this school was seriously damaged and appears to be beyond repair. Before alternative arrangements can be provided the children attending the school have been given a weeks holiday. To remember this sad day, in 2003 we planted a tree of remembrance in the school grounds. In an unexpected twist, when planting the tree we dug down to unearth the foundations of an old farm building, which we have preserved as a seating area and object of historical significance. Limitations of the site and the buildings were recognised and a new National Boys School was built in Hartop Road, leaving the Girls and Infants in the old premises. The Boys and the Girls and Infant School were both described as Church of England Voluntary Schools. Monday 16th May, after extensions and necessary alterations had been made at the Hartop Road School, the Junior girls and Infants left the old premises and joined the Junior Boys in one Junior Mixed School. The accomodation was for 200. Number on roll 214. 20th May, the school building was destroyed by wartime bombing. 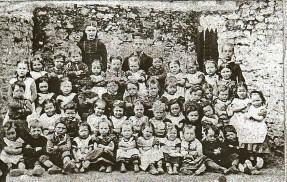 The St Marychurch pupils, together with Babbacombe CE, were transferred to Westhill Junior School, where the schools preserved their seperate identities until 6th september 1943. On that day St Marychurch C of E School was amalgated with Westhill County Junior School. 9th september. St Marychurch C of E Primary School was opened on the site of the school bombed 15 years previosly. It was built to accomodate 160 pupils. 66 pupils were admitted, 24 boys and 42 girls. 6th June Official Blessing and opening of 2 new classrooms. The accomodation was increased to 240. School Field opened and Environmental Area acquired. The opening of a Nursery and Family Learning Centre completed a lengthy programme of expansion and alterations. the school was renamed 'St Marychurch CE Primary and Nursery School'. Accommodation 315 full time places in the Primary School and 52 Half time places in the Nursery. We started school when we were three. I think most of us were put in Mrs Fentons Class. I remember Sports Day on the golf course by what is now the 18th green. Going the short walk to Church on Ash Wednesday and then having the rest of the day off. Picking walnuts off the trees that were outside using the green outer shells to make our fingers green to pretend we had been smoking. I started school at five years old at the Infants St Marychurch in Priory Road. Miss Lintern was our teacher, it was more or less one classroom and there were curtains instead of doors. On Empire day we would dress up. A boy and a girl would walk together to represent different countries. I walked with Paul Clifford and we were India and I carried a bowl of rice.